INTRODUCTION – Several techniques of retracting the gallbladder were suggested to facilitate performance of single-incision laparoscopic cholecystectomies. All require placement of transcutaneous sutures with resulting scarring, bruising and postoperative pain. We propose a new technique where gallbladder is secured to the diaphragm using intracorporeal sutures, thus allowing for more precise retraction and elimination of any scars outside the umbilicus. METHODS AND PROCEDURES – Records of 25 consecutive patients undergoing single-incision laparoscopic cholecystectomy by the authors were reviewed. In all cases gallbladder was retracted by placing a 0 Ticron suture on a tapered needle through the mid-body of the gallbladder (Figure 1)and then through the diaphragm (Figure 2). The needle was subsequently extracted through the same port that it was placed in, leaving both tails on the outside. Two tails were then tied to each other. Using extracorporeal knot pusher, the knot was advanced into the abdomen thus approximating gallbladder to the diaphragm and retracting it over the lever – similar to the direction of retraction in conventional laparoscopic cholecystectomy (Figure 3). After the gallbladder was completely dissected and separated from the liver, the suture was cut and organ was extracted (Figure 4). Traditional single-incision cholecystectomy techniques require placement of one or two transcutaneous sutures (often attached to long cutting needles) through the gallbladder. This results in pain and bruising over insertion sites and can contribute to intraoperative internal organ injury (liver, duodenum). Additionally, placing a cutting needle through the gallbladder, results in inevitable bile spillage. Finally, upward retraction is often limited to the area of 10th intercostal space since placing a transcutaneous needle higher than that may result in iatrogenic pneumothorax. Using our new technique, better retraction of the gallbladder over the liver is achieved. The point of fixation on the diaphragm can be chosen at any intercostal level. Additionally, use of a tapered needle minimizes gallbladder wall injury and results in diminished bile spillage. RESULTS – 25 cholecystectomies were performed for acute cholecystitis (4, 16%), biliary colic (15, 60%), choledocholithiasis (4, 16%), biliary dyskinesia (1, 4%) and gallstone pancreatitis (1, 4%). Excellent gallbladder retraction with cystic duct and artery visualization was achieved in 22 out of 25 cases (88%). In 3 cases (12%, all with biliary colic), additional 5-mm ports were required to achieve adequate retraction. We found the described technique of suture placement to be simple and easily reproducible. Critical view of safety (sub-cholecystic triangle) was visualized during all procedures. Selective intraoperative cholangiography was performed in 4 cases (1 of which required placement of assistant ports). 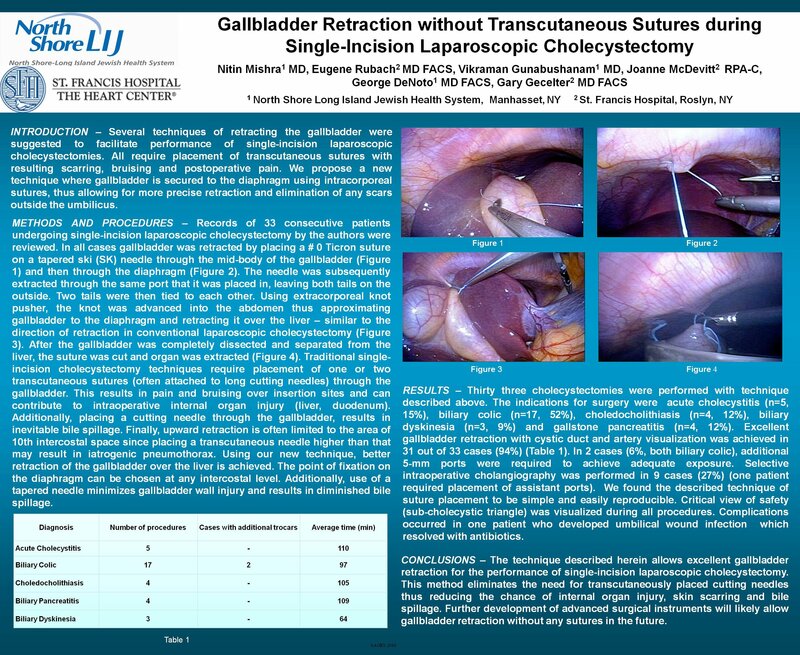 CONCLUSIONS – Technique described herein allows excellent gallbladder retraction for the performance of single-incision laparoscopic cholecystectomies. This method eliminates any need for transcutaneously placed cutting needles thus reducing the chance of internal organ injury, skin scarring and bile spillage. Further development of advanced surgical instruments will likely allow gallbladder retraction without any sutures in the future.